Making his AUDL debut with the Phoenix this season, Billy Sickles is no stranger to competition. 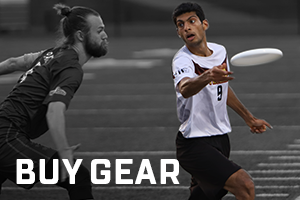 He began playing ultimate in 2010 as a senior at Westfield High School in New Jersey, after graduating he went on to play for St. Joseph’s University. In 2013 he burst onto the Philadelphia ultimate scene, helping his team earn a coveted black disc championship in the Philadelphia Area Disc Alliance summer league, then continued to rise quickly into elite club and professional level play. Sickles has helped lead his previous teams to championships at the national level and has been named MVP for his efforts. He is a highly accomplished player and shares his experience and knowledge by fostering ultimate players of all levels through participation in the Philadelphia Open Program. Sickles dominates in the end zone and is a key player on the Phoenix offense. He is most looking forward to going up against the DC Breeze, who the Phoenix will face on Saturday, April 20 in their first away game of the 2019 season. Sickles currently serves as the Program and Coaching Coordinator with Soccer Shots Philadelphia. The Philadelphia Phoenix's 2019 home opener is Saturday, April 27 vs the New York Empire. Phoenix tickets and season packages are available now.